An overlooked, yet critical component of good design is the program in which you choose to build your logo. The choice you make will greatly determine the level of editability and reproduction. To achieve the maximum level of versatility (in terms of size, reproduction and format conversion) it is very important to design your logo in a vector design program like Adobe Illustrator (the industry standard) or CorelDraw (my personal favorite). For Illustrator you can expect to pay around $600, or $1,800 when purchased as part of the excellent Adobe Design Premium Creative Suite (includes Photoshop, Illustrator, InDesign, Flash, Dreamweaver and Acrobat). CorelDraw is slightly cheaper at $500, but every bit as capable as Illustrator. The difference between the two I’ve found lies more in the interface. I tend to prefer CorelDraw because it’s more intuitive for people like me with an illustration background. Illustrator’s interface follows similar to the other Adobe programs, so its strength is in its familiarity — if you know one program like Photoshop or InDesign, the transition to Illustrator requires a relatively small learning curve. Both have robust feature sets and can import/export virtually any file format (with a slight edge going to CorelDraw, which also comes packaged with a healthy set of fonts, clip-art and stock photography). Choosing the right program is of paramount importance when beginning any project. A vector program when doing logo design is akin to using an image editor to touch up a photo, or a layout program to design an ad. Sure, one can use an image editing program like Photoshop to design a logo or create an ad layout, but it really isn’t what the software is designed to do, and as a result, you will encounter limitations. So why would one use a vector illustration program instead of an image editor or layout program when designing a logo? One word: versatility. An illustration program uses a series of mathematical points and lines to create images. This gives the logo the ability to be scaled to any size without any loss of image quality. Additionally, an Illustration program offers the ease of simplicity when converting to any other graphics file format. For example, a native Illustrator file can be exported or saved to TIFF, JPEG, PSD, EPS, GIF, PNG, SVG, BMP or PDF file formats. It’s easy to go from vector to raster, but in many cases it’s very difficult to go from raster to vector. Illustrator (using LiveTrace) and CorelDraw ( Power Trace) have built-in functionality and do a decent job in converting simple raster images to vector file, but struggle in maintaining realism with more photorealistic images. Vector files usually also result in smaller file sizes when compared to their raster counterparts, which serves as an added benefit when storing or emailing files. Since vector images also use mathematical points do define the image, output to printing devices will yield sharper images at all sizes than identical raster images. The first problem is that photorealism and special effects actually work against good logo design (as will be discussed a little later). Secondly, since an image-editing program depends on pixels, not mathematical points, it cannot be scaled without loss of quality. One can shrink the logo to a fair degree and still maintain image quality, but the logo cannot be scaled upwards without losing integrity. Doing so can result in image blurriness or pixilation (both of which are not desirable). Since one would need to create a logo that would be the most versatile, that logo would need to be initially created with such size and resolution that the mere file size would likely prohibit effective utilization on most computers and applications. Raster images aren’t easily converted to vector-based formats. This limits the logo to formats like TIFF, JPEG, PSD, BMP, PNG, GIF and PDF formats. These formats will work for most print applications (newspapers, magazines, posters, websites, etc. ), but not so well for things like vinyl signs, embossing/engraving or promotional products, where the vendors work almost exclusively with vector images. Though it doesn’t happen very often, some choose to use a layout program like as the primary means of logo creation. This just adds difficulty to an already challenging undertaking. Where TIFF, EPS, PDF, JPEG, PNG and BMP files will pretty much work in any layout application, files designed in Quark, PageMaker, In Design or (gasp) any of the Microsoft products (Word, Excel, PowerPoint, Publisher) are pretty much only good in the program that created it and generally not as versatile. One has to jump through hoops in order to get a layout program-based logo into formats that can be utilized by other programs. Of all the layout programs, InDesign is probably the layout program best suited toward logo creation because it has some of the basic illustration tools available in Illustrator and has the most file format export options. Quark Xpress and the discontinued PageMaker do offer an export to EPS option, but experience has shown me that to be a somewhat unpredictable experience. One really has to know a great deal about all the individual program capabilities in order to get a layout program to export its creation to a format that can be utilized by other programs. Sometimes the only way is via a screen capture, scanning a printout or printing to a PDF file, which adds just another unnecessary step to an already time consuming process. The bottom line is that for any project, one should choose the right tool for the right job. For logo design, that tool is a vector illustration program. It’s been my experience with logo design that the best logos are typically those that are square(ish) in nature. There have been many good horizontal- or vertical-oriented logos, but the best and most versatile logos are square in nature. Now, don’t take this too literally. I don’t necessarily mean that a logo has to be a square. Quite the contrary, it can be whatever shape you need it to be, a circle, an oval, a rectangle, and a diamond whatever. What I mean is that when you measure the logo end to end, it is roughly the same size as it is when measured from top to bottom. The reason for this is pretty simple. When a logo is designed, you need to design it for any possible application and space. For example, if a company does a lot of corporate sponsorships, its logo might be placed at the bottom of a print ad alongside other sponsor logos. If the logo was designed as a horizontal format and is placed in a vertical ad, the logo might be reduced to such a small size (if there are a number of sponsors) that it isn’t as legible. This is because the overall size of the logo is limited by the amount of available width in a particular layout. If there isn’t sufficient width available, the logo never achieves enough height to be legible. The same is also true for vertically oriented logos. To be legible, a vertically oriented logo is dependent upon having enough height to make up for the lack of width. If an area is too small, a vertical logo can suffer the same fate as a horizontal logo. The squarer is in its design, the less space it needs to be legible. It can fit in any area, and do so without sacrificing either height or width. It’s a little trick really For example, if you take the same instance of a corporate sponsorship as given earlier, a square logo can actually become more visible, more legible in less space than either a vertical or horizontal logo. Look at the three examples below. Specifically the “Cheerleaders, Inc.” logo which I developed specifically for this example. 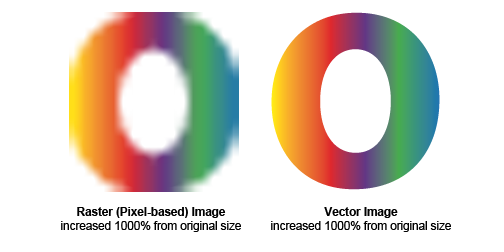 I created the logo in three different orientations: square, horizontal and vertical. In this situation, assume that we’re looking at the logo as part of a sponsor strip like one typically found on the bottom of event posters. Also assume that each logo only has a fixed space available to it (which does happen). The other logos in the example are fixed position. See which orientation of the Cheerleaders, Inc. logo makes best use of the available space and is most legible (the dotted lines represent maximum vertical space in a horizontal sponsor strip). Which one represents the Cheerleader, Inc. logo best? 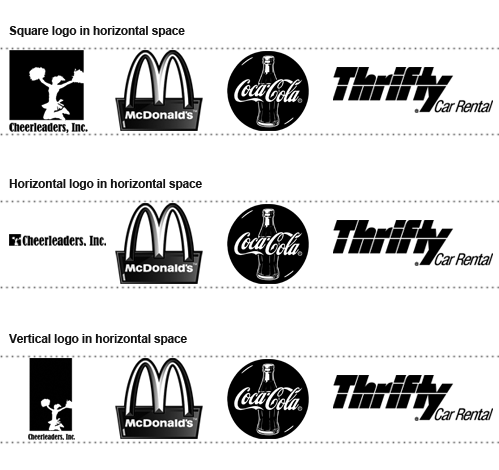 The square version easily competes with the McDonald’s, Coca-Cola and Thrifty logos. The horizontal version gets lost as it doesn’t have the necessary width to achieve the height needed to achieve impact. The vertical version does an OK job, but it isn’t as legible as the square and still seems diminutive when compared to the other logos. 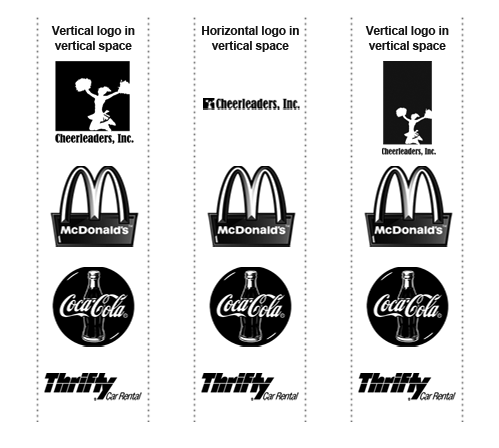 Next look at a vertical sponsor strip. Same conditions apply. 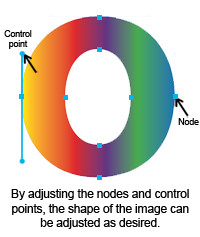 There is a fixed maximum width and height for each logo. In the vertical format, the square logo still does the best job at displaying the brand. The horizontal logo still gets lost and even the Thrifty logo, which is also a relatively horizontal format starts to suffer from the size constraints. The vertical logo does a better job than it did in the horizontal sponsor strip, but it still isn’t as strong as the square logo. As the above images show the more square a logo is, the better it is able to compete in all situations. Many businesses and establishments only consider the use of their logo design to the extent of how it will appear on their business cards, letterhead, envelopes and building signage. Such an approach is a shortsighted one and is one that can be avoided at the initial concept stage. More on this in upcoming sections of the Great Logo Manifesto.